The rising demand for antiquities from both private collectors and museums has resulted in a diminishing supply of archaeological objects in the traditional market, causing higher prices and the formation of a lucrative black market. As a result, looting archaeological sites has become a big business forcing countries to take measures to secure their archaeological heritage and prevent their export. Unfortunately, many of the most lucrative archaeological sites are in remote areas of impoverished nations. These nations have little money available to allocate to enforcement as well as inadequate bureaucratic and law enforcement capacities. Guarding archaeological sites and monuments is an extremely demanding task in term of funds and personnel, especially when the territory is large and the number of possible looting targets is high. So nations are often forced into using technological approaches to augment traditional enforcement. One such technology, which has the potential to make a significant impact, is the drone, which has become extremely attractive due to its relatively low cost and increased functionality. Archaeological remains represent the culture and tradition of these nations. The illegal removal of those remains eliminates a part of the people’s history and heritage, especially when those artifacts are sacred. As well, looting deprives the community from long term revenue as antiquities attracted tourism, whether through museums or at the archaeological sites, generating profits for the local economy. More importantly, looting of antiquities results in archaeological destruction. Although some looters are professional bandits, most are poor peasants that sell the antiquities to supplement their meager income. Even more problematic than the looting is the destruction the looters leave behind. The excavation and removal of artifacts is usually done secretly and quickly, with little care for the site, causing enormous and irreparable damage. In many cases, the destruction is purposeful, intended to eliminate evidence that may lead to the looters’ capture but unfortunately destroys the context of the remaining objects. Context is critical; where an artifact is found, what is found with it, and the set of relationships among artifacts and between artifacts and their surrounding structures, is almost more important than the object itself. For example, objects that may seem unimportant by themselves may acquire great significance if found next to other objects or far removed from their usual area of distribution. The illegal removal of antiquities and the hapless destruction of archaeological sites destroy the context and while the object may be beautiful and have inherent value, from an archaeological perspective, the objects are worthless. Ironically, while the looters wreak destruction for money, they rarely receive substantial reward for their illegal acts. Poor peasants do not have the networks to move the objects out of the country or into the hands of buyers willing to pay large sums and not ask questions as to how the object came to be available for sale. A recent study detailing the selling of “Old Testament” artifacts, Neil Brodie of Glasgow University estimated that diggers were paid about $10,500 for 28,084 pots that were subsequently sold in London for over $5 million. One artifact that later sold for $275,000 was initially traded for a pig, and a dancing Hindu deity bought for about $18 sold eventually for $372,000. How Do Countries Protect their Antiquities? Many countries, especially those with a rich archaeological heritage, don’t allow newly discovered objects to be owned by individuals. Instead, cultural objects are nationally owned, which is usually accompanied by stringent export controls that often amounts to a near-absolute ban on the export of antiquities. For example, Egypt’s Supreme Council of Antiquities (SCA), which is responsible for the conservation, protection and regulation of all antiquities and archaeological excavations in Egypt, is given significant recourses and political leeway to thwart the removal of any antiquities from the country. Under the SCA all cultural antiquities are deemed to be owned by the state and as such, there is a total embargo on exports of cultural property. Through the efforts of the SCA, over 3000 artifacts have been recovered in the last decade alone. Less artifact-rich countries will also have laws against the unauthorized excavation and exportation of antiquities, however, they are often more liberal or directed at specific antiquities, such as the Native American Graves Protection and Repatriation Act in the United States. Unfortunately, while the majority of countries having signed onto the UNESCO 1970: Convention On The Means Of Prohibiting And Preventing The Illicit Import, Export And Transfer Of Ownership Of Cultural Property under which the signatories agree to enforce each other’s cultural property export controls and regulations, countries with liberal import / export control often do not enforce the controls of more stringent countries. For example, the United States has implemented the National Stolen Property Act creates criminal liability for anyone who receives or possesses property that the person knows was stolen; if the buyer is unaware they are buying stolen goods, then they cannot be prosecuted. An additional issue for curbing looting is the understaffing and under-financing of law enforcement agencies, especially in developing countries where protecting archaeological heritage may rank low on their priorities. Instead, allowing the plunder of cultural heritage is an easy way for the authorities to put money in the pockets of poor peasants. Additionally, many countries are just fraught with corruption. In exchange for a bribe, poorly paid officials may be willing to turn a blind eye to illegal excavation and export of antiquities. The result is a systematic failure of law enforcement agencies to curb looting and outflow of antiquities. A result of the systemic failure to protect cultural heritage objects, some countries and third party conservationists, are turning to drones. While some archaeological sites are easy to protect, being small or located close to populated settlements, for example the Egyptian Pyramids at Giza. Some sites are remote, located in hard to reach places, where dangerous wildlife, such as jaguars, snakes or rats along with difficult terrain and harsh weather conditions, resulting in sites being undiscovered or lost. 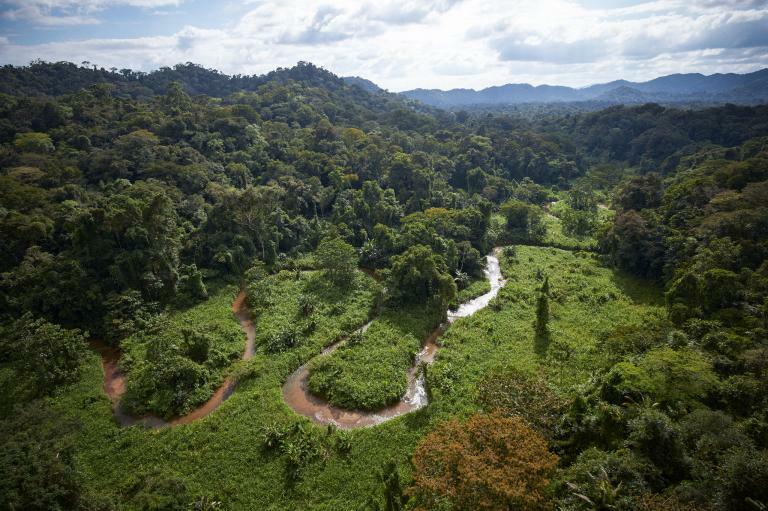 A recent Honduran archaeological expedition travelled deep in the Mosquitia, a vast and barely inhabited region of swamps, rivers, and mountains. To navigate the choking foliage, the team was guided by Steve Sullivan and Andrew Wood, two former members of the SAS, Britain’s Special Air Service, who are experts in bushcraft survival skills as well as several members of the Honduran armed forced. To access the site, landing zones were cut from the jungle, so that the archaeologists could then be ferried by military helicopter. The Mosquitia site excavation returned 57 items, only a fraction of the objects likely buried at the site. While the site is remote, it skirts a well-known drug trafficking route, so is far from uninhabited. Locals wishing to make some extra money could have pillaged the site, but luckily nobody had. Now, the local populace is aware of the site’s existence, which may prompt someone to loot it. Stationing soldiers there to protect the site is not an option but at the very least, aerial surveillance could provide some protection. Drones would be the most cost effective approach. 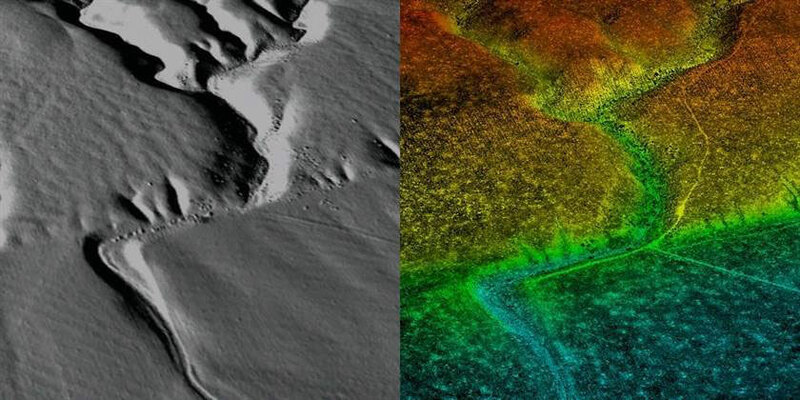 A pair of images derived from Lidar instruments. Drones can detect spots where new looting has taken place, giving the authorities time to stop the looter when they reach one of the area towns, or allow them to stay hot on the trail of the goods as they are being sold. The technique has been successfully implemented at Jordan’s 5,000-year-old Fifa graveyard. The “Follow the Pots” project shares aerial data with Jordan’s Department of Antiquities. The site hosts more than 10,000 Bronze Age tombs stuffed with pottery, carnelian beads, and shell bracelets. Using drones, the project discovered dozens of holes, each hand dug, by an army of looters, which ultimately helped in the recovery of several Bronze Age pots that turned up in local shops of antiquities dealers. Another approach is to find as many sites as possible, determining the most important, and protecting those sites or send expeditions to do some preliminary excavation and mapping before looters can stumble upon them. South and Central America was home to the Incas and Mayans; both having large cities, now lost, taken back by the Jungle. Discovering these cities has been difficult due to the heavy canopy cover, with most of the civilizations under trees that can grow up to 200 feet tall. One effective technique for seeing below the canopies is thermal imaging. Over the course of a day and a night, different parts of a landscape heat up and cool down at different rates, including specific objects such as buried stone, which will retain heat longer than dry soil. In the early morning, the buried stones will be much warmer than the soil and those temperature differences can be picked up on a thermal camera mounted on a drone. So if the drone flies over a stone wall from a buried ancient city, the thermal camera will detect it. Jesse Casana, an archaeologist at the University of Arkansas, used a store bought drone to take thermal images of a site in northern New Mexico, which was buried under a meter of desert sand. Most of its ancient stone architecture is obscured, and it’s hard for archaeologists to even know where to start digging. Casana and his team mapped many of the community’s buried structures but more importantly found a great kiva, a type of underground ceremonial structure which helped pinpoint the most promising places to begin their excavations, and is also the area that would need the most protection from potential looters. The failure of the traditional legal process, in many countries, to effectively combat looting of cultural heritage sites is disheartening, especially when we see how effective a country like Egypt can be at protecting their cultural artifacts. Yet, using unmanned aerial vehicles and advanced imaging techniques does seem like a bright spot in the fight against looting, with the potential to make a huge difference. Drones can supplement the lack of manpower through technology-based solutions. Drones can be outfit with thermal imaging equipment, infrared sensors, magnetometers, barometers, GPS devices, and all sorts of cameras, and can even be outfitted with LiDAR, (Laser Illuminated Detection And Ranging) which can create high-resolution 3D terrain map, even if the terrain is under a thick canopy. New technologies, such as Google’s Project Tango, a phone-like device packed with sensors that can record minute details of movement, as well as the increasingly lower prices and longer flying ranges for off-the-shelf drones, will continue to make the unmanned air vehicles an attractive tool in the fight against looting and plundering of ancient artifacts.